Doodles often end up being much more, which is sometimes a problem if I’ve started doodling on a scrap of paper, or if I’m simply sketching in a corner of another drawing. 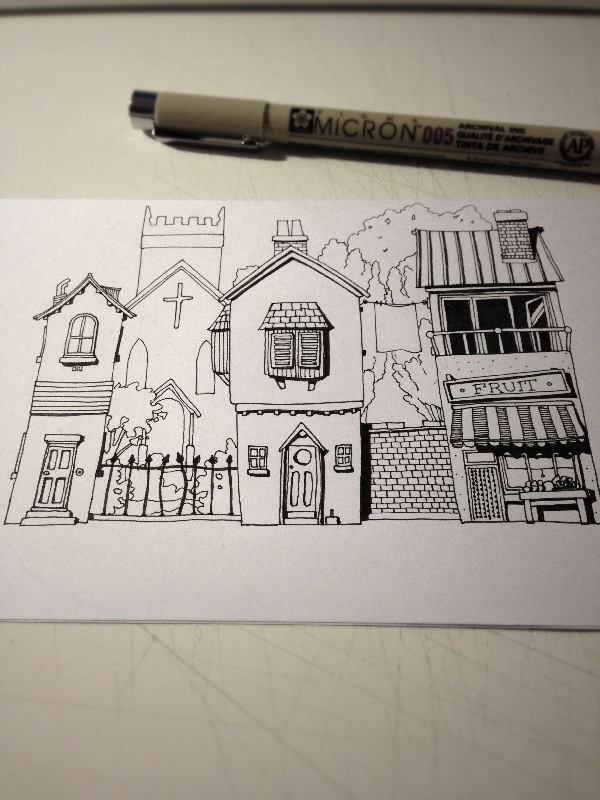 However, yesterday, my doodle simply evolved to fill the space available. 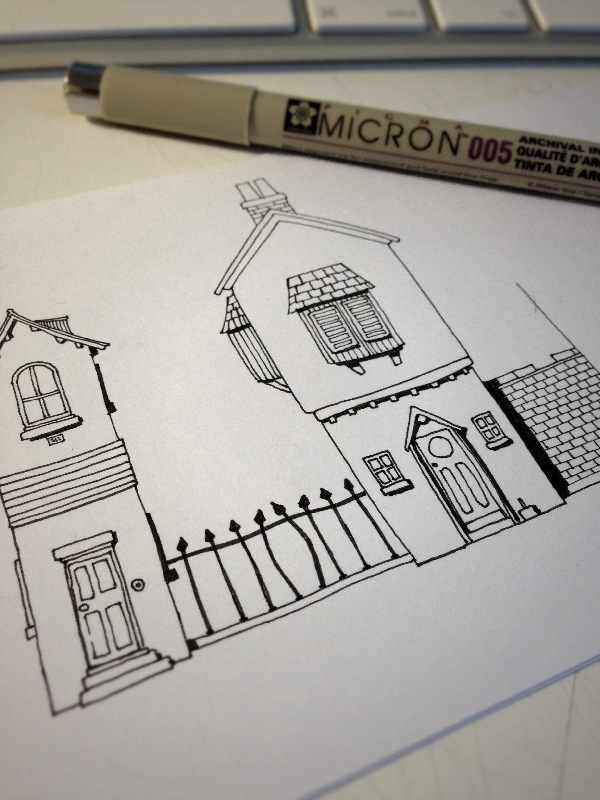 I began scribbling the beginnings of a house on a folded piece of paper I was using to keep another drawing clean while I worked. I quite liked where it was going, so I carried on, and on. Eventually filling the space I had with half a street’s worth of buildings. 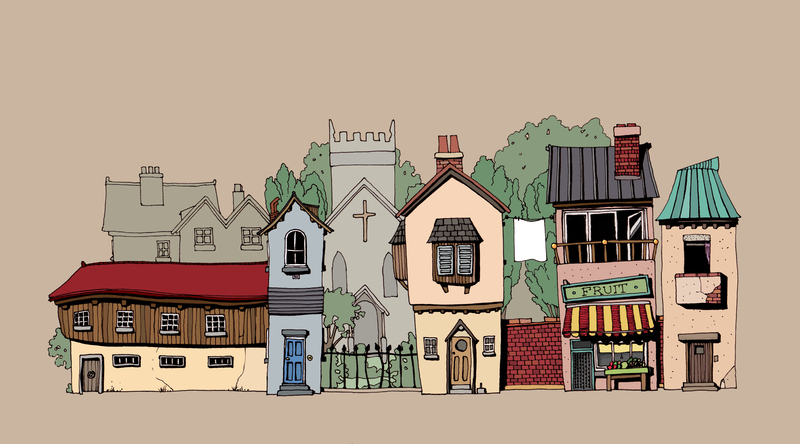 I added some background, and extended the street with a little tudor building to the left, worked in a bit more detail and the pen work was finished, just the colouring was left. 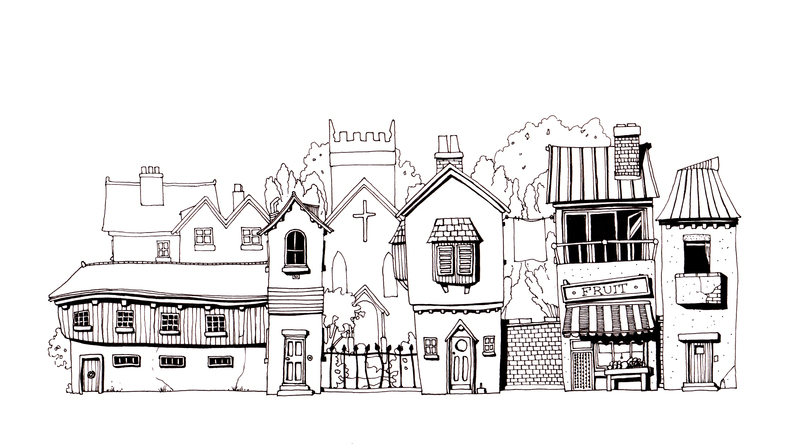 The builders have finished, Doodle Street is complete. Me too Amy, it’ll be even better when I draw the flower shop, the cake shop, and the pub! I’d easily have this on my living room wall – it’s fab, so whimsical! Hi Viki, glad you like it! And of course you can like the black and white versions more! I do too. Hi Julie, thanks for your message. I do accept commissions – and I love branding work. If you’d like to drop me an email – rob at thisnorthernboy dot co dot uk – and let me know what kind of thing you’re looking for that would be great. Thanks Rob I will do that over the next few days, in the meantime I will research some ideas! Perfect. I’m heading on holiday next Wednesday, so if we could have a chat before I go away that would be great. This is wonderful. Beautiful. I love this so much. Just so you know, there is a lil girl livin in Kuala Lumpur falling in love with your doodle. Hi, i read your blog occasionally and i own a ssimilar one and i wass just wondering if you get a lot oof spam comments? I get so much lately it’s drivung me mad so any support is very much appreciated. Hi Rob, I’ve just emailed you to talk about doodle street…I thought I’d better let you know in case if disappears into your junk file! Many thanks.